This study reveals how the social pact, formalized during the armed stage of the Mexican Revolution (1910-20) and implemented during the second stage (1920-40), was upset during the third or arrested stage (1940-70) when the bureaucrat-professionals at the helm opted for intensive economic development by taking the capitalist road. Although momentarily revived during yet a fourth stage of revolution (1970-82), this social pact was subsequently betrayed from within by the official party of the Revolution and undermined from without by the operation of economic forces behind the scenes. 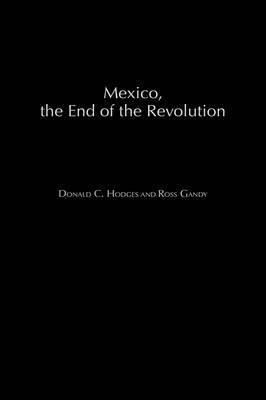 In this first book on the complete history of the Mexican Revolution, Hodges and Gandy reveal that, along with the end of its social pact, Mexico passed out of its former nationalist and capitalist orbit to enter the new professional societies and global order fathered by the transnationals. From 1920 to 1970, Mexico's bureaucrat-professionals hung onto political power while native capitalists continued to flourish. In response, Mexico's workers and peasants staged strikes against the nationalized sector and fomented guerrilla wars. Concessions were then made to this group until, beginning in 1982, the social pact was again eroded at the expense, not only of the popular sectors, but also of the capitalists. The economic surplus was redistributed away from owners and into the pockets of professionals. That was the Revolution's last gasp before it was officially put to rest in 2000 with the official party's defeat at the polls. Hodges and Gandy challenge the current belief that Mexico's economic system is still capitalist by presenting statistical evidence that shows how the chief beneficiaries of the economy are no longer the providers of capital, but instead the providers of professional services.